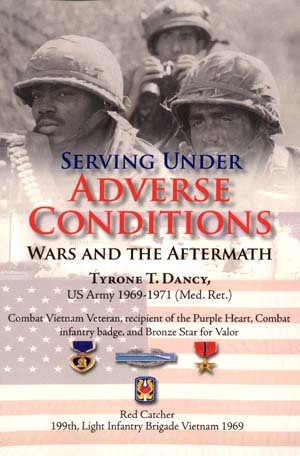 Dancy, Tyrone T. Serving Under Adverse Conditions: Wars and the Aftermath. Bloomington, IN: AuthorHouse, 2005. If you have ever sat and listened to a Vietnam Veteran detail the accounts of his or her experience and had not been there yourself to understand these stories, you most likely were left understanding only the story, but detached from the feelings that remain for those that fought and served during that time. "Serving Under Adverse Conditions" removes that detachment for the reader. You will walk where he has, you will see what he has seen through this biographical account. This account will give you some idea why many from that era and similar experiences, often sit alone, unable to express the horrors they witness and the injustices they have lived through. With a humble and modest approach, the writer will let you feel what it is like to have your body perforated with multiple shrapnel, while being propelled through the air in defiance of gravity. You will walk in the shoes of those human beings who live with service incurred disabilities, share the sorrows and their struggles, and rejoice in the power of the human spirit through these pages. Foremost, you will be forced to consider the "Adverse Conditions" of being a disabled Vietnam veteran, and an African-American, and societal exile for their Military service during much of the 1970's and 80's. Where society couldn't meet his need, Tyrone met societies. Through his compelling narrative style, he reminds us that we are all human beings and God's children. You are about to embark on a walk through time, you shall not forget.